Hello World! It's Tizzy again. I wanted to let everyone know that I've been helping Deedy again. (Her official name is Dorothea Jensen, but that's too long and complicated for us elves to say every time we want to get her attention.) Anyway, she doesn't know much about modern techie stuff. 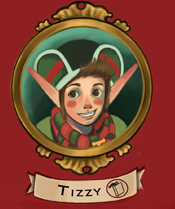 That's why she asked me to start posting some of the preliminary sketches Michelle Alfonso has made to illustrate the story of My Most Exciting Adventure So Far, also known as Tizzy, the Christmas Shelf Elf. I just posted the very first one on our Pinterest account. This sketch shows my two heroes, Owen and Alex, sneaking downstairs on Christmas morning before their parents are up. A very, very naughty thing to do. (I've already told you that they do something much naughtier later on, but I'll show you a picture of that in a future post.) Here's where you can see the sketch: http://pinterest.com/izzyelves/pins/. As I told you in my last blog, Deedy has already written down what happened to my favorite lass, Blizzy, when I was off having My Most Exciting (Also Scariest) Adventure So Far. Blizzy's story is called Blizzy, the Worrywart Elf, because all of the other elves thought she was worrying way too much when she couldn't find me on Christmas Morning. But she wasn't just worrying: she was INVESTIGATING. Not much else is going on with the Izzy Elves, although I heard a rumor that Dizzy has been having secret meetings with Deedy. I don't know what on earth he's been up to, but he must have a story to tell. I'll ask around and see if anybody knows what's up with Dizzy. I do know that all last year, when he and I were working next to each other, he kept asking me questions about My Most Exciting (and Scary) Adventure So Far. Of course, I didn't mind telling him all about how Owen and Alex managed to send me back to the North Pole when I was delivered to them by mistake. It was, after all, a very exciting (and scary) story with a happy ending. But I did notice that as the months went by, he started getting very quiet when I told him my tale. For awhile I thought that he was just feeling scared by what he heard, but then he started saying odd things. But more about that later. The only other thing happening of note is that Frizzy has asked Santa if she can do a new job in the workshop. Apparently, she gets so attached to the dolls whose hair she cuts and curls that she is very depressed when Santa takes them away for delivery. She hints that she has a tremendously exciting idea in mind. I'll keep you posted on further Frizzy developments!